My sister suggested we tour Morven Park one day after she attended a riding competition there (Morven Park is well known among the horse set). The grounds of Morven Park encompass 1,000 acres of lawns, fields, wooded areas and boxwood gardens, including the mansion, stables and a show ring(s), and a museum of coaches. As we walked around the gardens, she pointed out various steeple chase jumps. I wished there'd been a show that weekend so I could have seen the horses in action. Although located in Leesburg, VA, Morven Park has very close connections to Baltimore and Maryland. Thomas Swann Jr., used Morven Park as his summer home while serving as mayor of Baltimore between 1856 and 1860 and before becoming Maryland’s governor in 1866. Although his election may have been questionable, he became known as a good governor for Baltimore. He eventually served as U.S. Representative from Maryland's 3rd Congressional district and then the 4th Congressional district. His career began -- and this I find most interesting -- in the railroad industry in 1834. Swann rose to be director and president of the Baltimore & Ohio Railroad in 1847, serving in that position until his resignation in 1853. The second governor to inhabit Morven Park was Westmoreland Davis, governor of Virginia from 1918 to 1922, who along with his wife Marguerite, purchased the property in 1903. 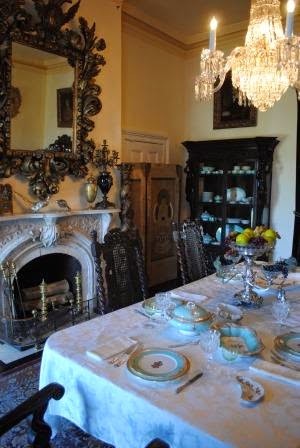 The mansion reflects the Davis period of occupation, with their original furnishings and personal belongings. Westmoreland Davis was born to a wealthy and prominent family on August 21, 1859, on a boat in the Atlantic Ocean. The Davis family was a prominent, slave holding family, and lost most of its wealth during the Civil War. Davis and his mother, left a widow by the war, struggled financially after the war, but he was able to attend the Virginia Military Institute on a scholarship. After graduating in 1877, he taught for 2 years then went to work as a clerk for the railroad company. Later, he completed a year of post-graduate study at the University of Virginia in 1883, and studied at Columbia Law School from 1884 until graduating in 1886. He joined an elite New York City law firm and became wealthy. Marguerite's family, extremely wealthy themselves, hired Davis, and it was then that he met and eventually married her. When Westmoreland and Marguerite Davis purchased Morven Park in 1903, they inherited a landscape that resembled English private park estates. The road winding through the landscape passed through magnificent wrought iron gates, a gift from the citizens of Baltimore to their mayor, Thomas Swann, Jr.
Wrought iron gates given to Swann by the citizens of Baltimore. furnishings, which include 16th century Belgian tapestries, hundreds of silver pieces, Hudson River Valley paintings, and Asian treasures -- in the Mansion’s collection all add to the sense of the Davises’ everyday lives. It is decorated in a rich, gaudy style that reflects the materialistic dedication to excess of Victorian aesthetics. While visiting Morven Park, don’t miss the unique collection of horse-drawn vehicles in the Winmill Carriage Museum. The 40 antique coaches, carriages, sleds and carts range from utilitarian to regal. While two of the carriages belonged to Westmoreland and Marguerite Davis, the rest were donated to Morven Park by the late Viola Townsend Winmill of Warrenton, VA, in 1967. Of particular interest is the miniature road coach once owned by General Tom Thumb of the Barnum and Bailey Circus and an elegant caleche Mrs. Winmill loaned for the use of Grace Kelly in one of her final movies before becoming “Princess Grace.” Also on display is the very ornate antique hearse that carried Mrs. Winmill’s remains during her 1975 funeral. Also on the grounds is a glimpse into life at a winter encampment of the Civil War. Morven Park became an encampment and training site for Confederate forces until they abandoned Leesburg in early March 1862. From late December 1861 to March 6, 1862, two companies of the 17th Mississippi Infantry Regiment constructed and stayed in winter huts. Know before you go: Leesburg is a quaint and lovely little town -- at least, the historic part of it is. Plan to spend an hour or two walking around exploring. For you Civil War buffs, Balls Bluff is right around the corner. Getting there: 17263 Southern Planter Lane, Leesburg, VA 20176; setting your GPS or on-line search to “Morven Park” may take you to the wrong entrance, so please use the address provided here for tours of the mansion. Dogs: Droopy tails since Fido isn't welcome in the museums. If you don't want to go into the house, or plan just walking around Leesburg exploring, then would be perfect to bring your pooch along. Hours: Morven Park’s three museums are open for tours Thursdays through Mondays (closed Tuesdays and Wednesdays). The Civil War Encampment Site and the gardens are open daily.